The resolution of singularities is one of the major topics in algebraic geometry. Due to its difficulty and complexity, as well as certain historical reasons, research to date in the field has been pursued by a relatively small group of mathematicians. However the field has begun a renaissance over the last twenty years, boosted by many small conferences and schools, with the discovery of more conceptual proofs of the characteristic zero case, as well as several brilliant attempts at the still unresolved prime characteristic case. 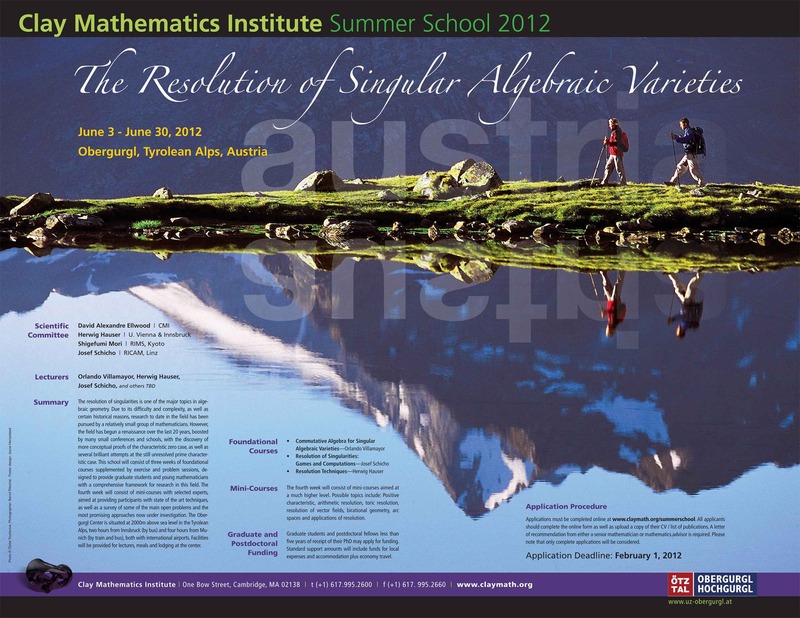 This Clay Mathematics Institute Summer School at Obergurgl in the Tyrolean Alps consisted of three weeks of foundational courses supplemented by exercise and problem sessions, designed to provide graduate students and young mathematicians with a comprehensive framework for research in this field. The fourth week consisted of mini-courses with selected experts, aimed at providing participants with state of the art techniques, as well as a survey of some of the main open problems and the most promising approaches now under investigation. We will present Rees algebras as a tool to address different problems in resolution of singularities over perfect fields. In particular, we will focus on the problem of globalization of local invariants in characteristic zero, and study questions related to multiplicity in positive characteristic. We give a survey of what is known in the subject, mostly presenting results and methods of Abhyankar and Hironaka. The first case considered is that of Artin Schreier extensions in dimension two, which already illustrate fundamental obstructions to resolution. From here we move to a discussion of how an algorithm for resolution of Artin Schreier extensions extends to a proof of embedded resolution of singularities in dimension two. Then we present a proof of resolution of 3-folds. We will also discuss some recent results in the area, and open problems. Given a toric variety X it is well-known that by refinement of the fan defining Xone may obtain a resolution of singularities. This gives a toric morphism. In this talk we will focus in a different direction, we will use binomials defining the toric variety instead of fans. The goal is to produce a sequence of combinatorial blowing ups such that the final transform is an embedded resolution. Every center of blowing up is computed using an upper-semicontinuous function, in a similar way as in the general case, but the coordinates are much simpler. This algorithm is valid for toric varieties over a perfect field of arbitrary characteristic. Lectures on the speaker's recent work on the resolution of singularities. Idealistic Filtration Program (IFP) is an approach to the resolution of singularities of algebraic varieties. The object of IFP is idealistic filtraion, which is a kind of algebraic reformulation of Hironaka's idealistic exponent (or Villamayor's basic object, Bierstone-Milman's presentation, and so on). Its saturations, namely differential saturation, radical saturation and integral closure, plays important roles in IFP. In this talk, I will explain idealistic filtration, their saturations and relations among them. Though their origin is in the context of resolution of singularities, they are enough attractive in its own. Roughly speaking, IFP intends to follow the algorithm in characteristic zero by replacing maximal contact with the leading generator system. The leading generator system is derived from the analysis of algebraic structure of differentially saturated idealistic filtration, and it works in any characteristic. In this talk, I will introduce the leading generator system, basic invariants and explain some basic results like what we call nonsingularity principle. Building upon the computational foundations laid in Josef Schicho's course, we shall review some computational aspects of blowing up, of the choice of center and more efficient approaches to desingularization in special cases like surfaces or binomial varieties. Then we will proceed to computational applications of resolution of singularities in singularity theory, algebraic geometry and algebraic statistics. After all these considerations in characteristic zero, we shall consider computational experiments in positive characteristic as a last topic. In this series of talks, I will expose a recent result in collaboration with Michael Mcquillan on resolution of singularities for one-dimensional complex foliations in three dimensional ambient spaces. A special emphasis will be put on the main differences and difficulties with respect to the desingularization of singular varieties. Talk 1: Singular foliations (definitions and examples), blowing-up and weighted blowing-up of singular foliations, terminal, canonical and log-canonical singularities, review of the classical result of resolution in dimension two (Bendixson-Seidenberg). Talk 2: Dimension three: Non-existence of maximal contact, "hidden symmetries" and non-existence of resolution in the category of smooth varieties. Newton polyhedron of a vector field: the construction of the main invariant. Local algorithm of resolution of singularities in dimension three. Global patching. The proof of existence of resolution of singularities of algebraic varieties in characteristic zero can be divided into two parts. First, there is an algebraic part, providing necessary constructions such as blowups of manifolds along submanifolds, differential closure, transforms along blowup, descent in dimension, transversality conditions, and properties of these constructions. Second, there is a combinatorial part that consists in the setup of a tricky form of double induction taking various side conditions into account. These two parts can be cleanly separated: once the properties of the algebraic constructions are stated in an axiomatic way, it is no more necessary to do any algebra in the induction proof. The goal of this lecture will be two-fold. First, we want to introduce all the algebraic constructions mentioned above, prove their properties, and provide algorithms that carry them out effectively. For this purpose, we will use the computer algebra system MAGMA; this system has built-in functions that will be convenient (variable elimination, syzygy computation). The participants are expected to do various exercises. Second, we will translate the axiomatic description of the properties of the algebraic constructions (blowups etc.) into rules of a combinatorial game between two players. We will prove that the second player has a winning strategy; this implies the existence of resolutions of singularities. Prerequisites: For the algebraic part, participants are assumed to be familiar with basic concepts in algebraic geometry: schemes, projective morphisms, syzygies. The combinatorial part requires no background. Regular varieties. Monoidal transformations on regular varieties, Higher differential operators. The notions of order of an ideal and of multiplicity for an embedded hypersurface. Rees algebras and differential algebras. Integral closure of algebras and their monoidal transforms. Special features of positive characteristic. Elimination algebras. Application to resolution of singularities. We will study higher versions of Nash blowup. These blowups provide a possibility to resolve singularities in a single step. It works only in limited cases. However the obtained desingularization has a nice description as a parameter space of geometric objects. We will define these blowups, study basic properties and survery known results. If time permits, also the computational aspect will be discussed.